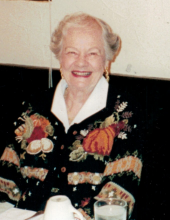 Virginia Mingus Heina, 96, of Owensboro, formerly of Boone NC, and Louisville, KY died Sunday, March 24, 2019 at Wellington Parc in Owensboro. She was the second child born on October 9, 1922 in Breckinridge County to Betty and Roscoe Mingus. She was preceded in death by her parents, her husband Fred L. Heina, her only child, Charlotte Heina Collie of Boone, NC. Also preceding her were her brothers, Charles Mingus, Robert Mingus (Jr); sisters, Anna Crawford, Mabel Kays, and Norma Kerekes. She is survived by 3 grandsons, Page, Stephen, and Andrew Collie and their families. She had 7 great grandsons and one on the way and 2 great granddaughters. Surviving also is her sister, Mary Jo Carter and brothers, Merl and Donald Mingus. Many nieces and nephews of the Heina and Mingus families also survive. Dale Collie, her son-in-law also survives. Services for Virginia are Wednesday, March 27, 2019 at 1:00 pm at the Cloverport Funeral Home in Cloverport, KY with her grandson Stephen Collie officiating. Visitation will be at the funeral home from 11:00 am until service with burial following at Cloverport Cemetery. The family would like remembrance to go to her former church in Louisville, St. Paul Methodist Church. Envelopes will be provided at the funeral home. You may share your thoughts and memories of Virginia on our website: www.cloverportfh.com. To plant a tree in memory of Virginia Lee Mingus Heina, please visit our Tribute Store. "Email Address" would like to share the life celebration of Virginia Lee Mingus Heina. Click on the "link" to go to share a favorite memory or leave a condolence message for the family.